BERLIN, Germany -- The Buddhist art of Gandhara seems strangely familiar to western eyes, its western legacy being self-evident. Gandhara is the name of a historical region now divided between today’s Pakistan and Afghanistan, which in its heyday extended from Bactria through the Hindu Kush to north-central India. It became known to a wider public when the world’s largest statues of Buddha, the giant figures carved out of a cliff in Bamiyan, were demolished by the Taliban in March 2001. 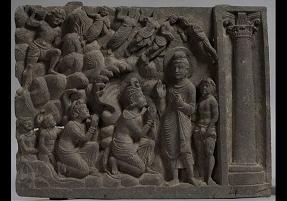 << Buddha bekehrt den Schlangenkönig Apalala Dharmarajika-Stupa-Komplex, Taxila, 2. Jh. n. Chr. Grauer Schiefer. Taxila Museum, Taxila, Pakistan. The art of Gandhara is mainly devoted to Buddhism. The Buddha himself was not shown in the form of an image until the 1st century CE. Previously there had been no such representations of the “Enlightened One”, who had been worshipped through symbols. The exhibition is a production of the Art and Exhibition Hall, Bonn, and brings to life the extraordinary cultural legacy of this region, a melting pot of cultures, before our eyes. The combination of so many cultures was a result of the trade between the Roman Empire and East and South Asia along the Silk Road. It was also via this route that Buddhism spread from India. Furthermore the vast territorial conquests of Alexander the Great had established the influence of Greek culture. Thus numerous Greek and Roman influences are to be found in Gandharan art. Around 300 unique objects, including finely crafted stone sculptures, filigree reliefs, precious coins and magnificent gold jewellery, take us back to the golden age of Gandharan art, which lasted from the 1st to the 5th century CE. The bulk of these objects come from museums in Pakistan, whose generous support made this project possible. The architecture of the exhibition is based on that of the courtyard of a typical Buddhist monastery in Gandhara. The central point is a stupa: a monument on which the spiritual development of a Buddha is depicted in 36 reliefs. The other exhibition rooms provide an insight into the cultural background and architecture of Gandhara. In a novel development visitors will be given the opportunity of exploring the destroyed statues of Buddha at Bamiyan in a virtual manner. In association with the departments of Information Technology/Telecommunications and Architecture at RWTH, Aachen’s technical university, completely new methods of presenting exhibitions have been developed. The destroyed statues of Buddha at Bamiyan have been resurrected using the latest 3D reconstruction techniques. For some years now international experts have been working to ensure the lasting preservation of the remaining original fragments. Now success has been achieved in mastering the geometry of the monument using state-of-the-art documentation techniques and a special laser technology. The measurement data are shown in the exhibition in a 3D stereo projection and uniquely made visible for visitors with the aid of special goggles.